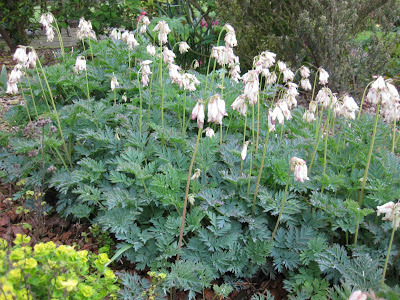 I am delighted to inform you that the April issue of The English Garden will feature my dicentra collection. I have seen lovely pictures and perhaps in the future they will allow me to publish some of those they do not use. I thought I might celebrate by showing pictures of my own by means of linking to previous posts. There are eight! If you think I repeat myself rather often you can confirm it today. The posts are in reverse order going back nearly five years. Just click the link. I confessed that if they were doling out National collections they would not choose me now. I just love Dutchman’s Breeches. Mine is coming into flower this very day. 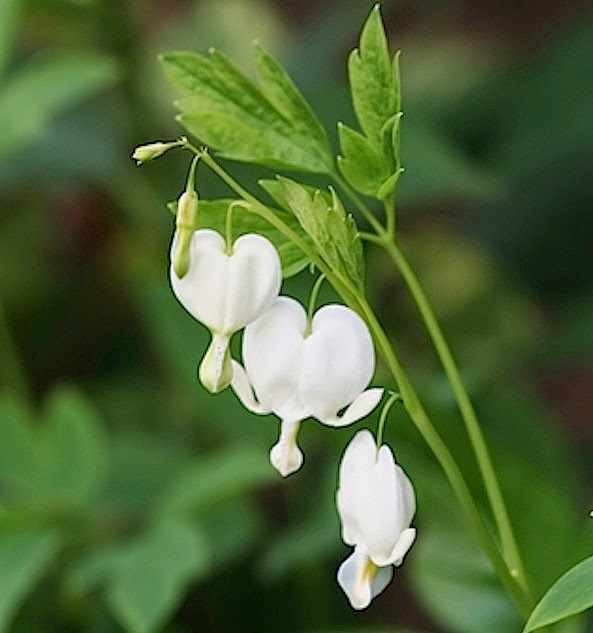 Yorkshire author Joyce Fussey’s dicentra had a story (one as delightful as those in her books) and her plant was launched at Chelsea thirty years ago. I am told there will be some dicentras at Chelsea this year. 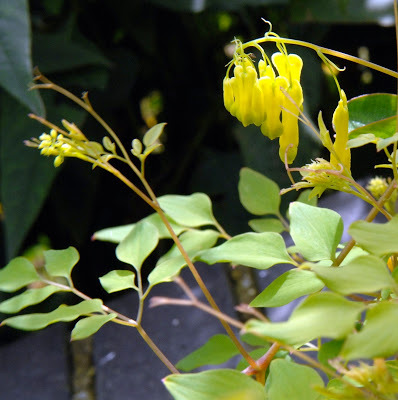 Climbing Dicentra scandens has also changed its name. My early posts are much briefer than now. 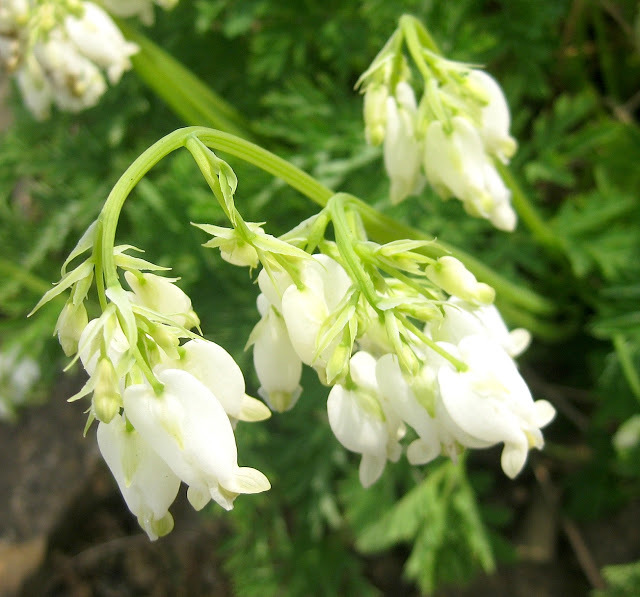 Oh how things have changed but Dicentra ‘Pearl Drops is still with me. I bristled when I read on a fine technical North American gardening blog that ‘of course organic fertilisers were best’. I only cooled down when I realised that over there popular gardening culture allows bulky organic material and manure to be defined as fertiliser. New gardeners over here often make the same mistake. My argument today is about fertilisers which are legally defined as ‘a concentrated source of nutrients’ Such fertilisers might be either inorganic or organic Organic ones are derived from plant or animal sources - although in this mad world we live in, certain so called ‘natural’ inorganics are honorary organics too! Bulky manures such as farmyard manure also contain nutrients - even enough nutrients if used wisely to provide for most gardening needs. Such bulky organics do much more than merely provide nutrition and are excluded from my arguments today. A few fertilisers defy precise definition and such materials as chicken droppings by virtue of concentration are best thought of as a fertiliser rather than as a manure. It’s not my purpose today to decry organics (although for many I actually do). 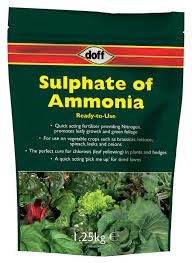 My aim is to explain why when I look to feeding my plants I personally always use inorganic fertiliser. Somehow gardeners have got the false notion that organics in some way are more worthy. There are no general grounds whether environmental, or of efficiency, precision, hazard, cost, safety, plant and soil health, crop quality, taste or yield where I agree that organics are better. Not even smell. There are of course individual exceptions. Some organics are excellent for specific needs and some inorganics (such as rock dust) are useless and some if misused might kill your plants. Gardeners need very few different fertilisers. I suggest three. 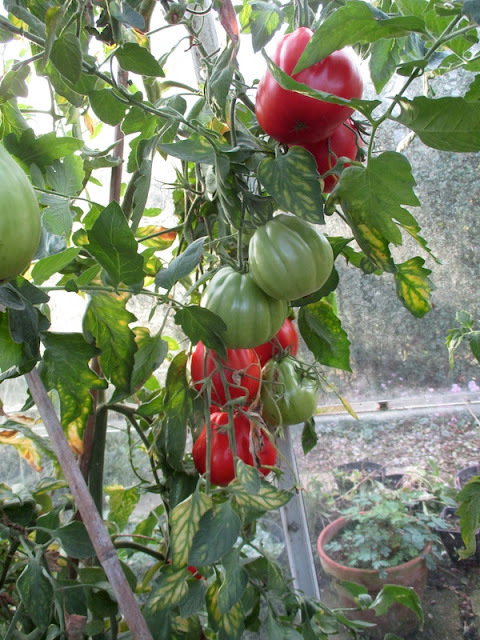 That would be a balanced nutrient general fertiliser, a slow release one - only if they make up their own potting composts - and a good general liquid feed such as one sold for tomatoes. Some soils will benefit from lime and personally my own lawn enjoys iron sulphate. I have argued before that you need just one general granular fertiliser. I use yaramila. There are others its equal but it is the right one for me. It holds all the six major plant nutrients (with NPK in fairly even proportion) and most of the trace elements. Your soil might not be deficient in trace elements, lucky you, but are you sure? The plant will take up the nutrients it needs and most of the remainder will enrich your soil and benefit future crops. You won’t find yaramila at amateur gardening suppliers but it is readily available on the net or from a trade horticultural supplier. It comes in 25kg bags. You get the price benefit of scale when you buy such a big bag and for the average gardener it will last several years - or you can split a bag with friends. My own last purchase cost £22. It is a hard nutrient prill that stays dry in storage.It is soluble and will quickly benefit your plants. It is not sufficiently soluble for conventional liquid feeding. I illustrate my case today with how I use my yaramila. No organics for me do the job so well. Most of my vegetables get a top dressing (scattering on surface), very little for some and rather more for brassicas. By careful placement I avoid contact with young plants. I don’t generally use any fertiliser at all in my ornamental borders but it is becoming apparent on my very sandy soil that certain plants benefit hugely. With fertiliser my Cyclamen coum, monarda, rhododendrons do so much better and hungry delphiniums thrive. My house plants are top dressed too. Personally I find it more convenient and just as good as liquid feeding. 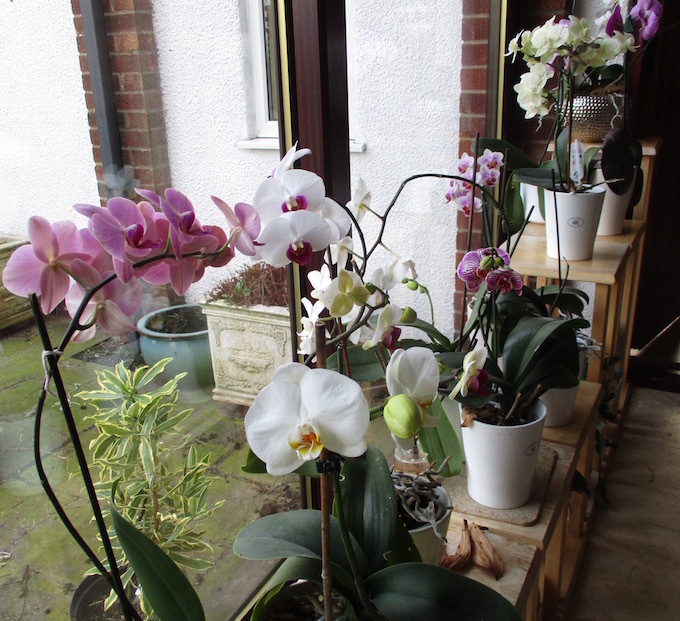 Even our orchids are so much better for a dozen granules every two months. When making up composts for lusty large plants such as tomatoes I use yaramila sparingly as a fertiliser base dressing. (I can top dress with more later). 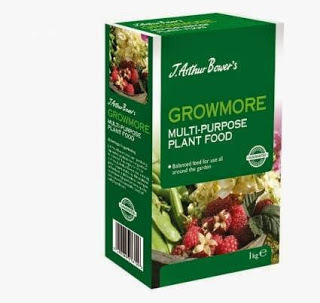 Never for delicate seed or seedlings - it is harmfully soluble. Not one for beginners! My scientist friend Peter recently made up a soil based compost using yaramila at 1 gram per litre which he calculates to be the same strength as a ‘medium’ commercial compost.. The complete analysis of yaramila makes it particularly suitable for the nutrient charging of my homemade charcoal which I am now using as a seed and potting compost. Although some organics such as hoof and horn meal were the bedrock of a slow release source of nitrogen in old formulations of John Innes composts it has now been superseded by the coated inorganics. Variously described as timed release or programmed release they give up their nutrients in a very gentle way and as nutrient diffusion is temperature related give up their goodness when the plants most need it. In tubs, pots and baskets their gradual release of nutrients reduce leaching. Coated fertilisers have various analyses and you can choose one supplying all the major nutrients and trace elements. They are not cheap! Are not all the rugby and soccer pitches on the television so healthy, green and magnificent right through the Winter these days? I wonder how many are using slow release inorganic fertiliser. As stated yaramila is not slow or controlled release. I have previously used coated slow release when making up my potting compost as does plant propagator friend Peter but with my current methods I don’t. 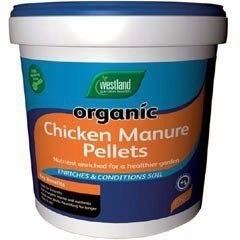 I have not given any evidence today why I actually think organic fertilisers such as blood, fish and bone, fishmeal, chicken droppings, seaweed extracts are inferior to inorganic but In the past I have explained why I scorn bonemeal. My previous efforts on fertilisers supplement this post. I made a case for yaramila here - and say more why I consider the use of special fertilisers for particular plants is usually a rip off. 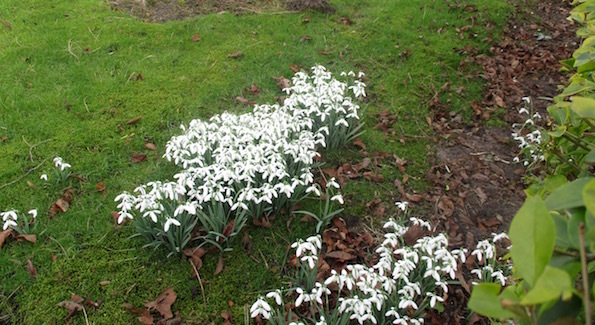 I discuss using fertiliser in Winter. I have argued that proper use of fertilisers might improve soil structure and can be used to build up the fertility of a soil. I attempt to puncture the modern myth of rock dust as a nutrient source. Ironic that I start writing this post sitting in Madeira.There are no snowdrops here - no cold and no snow. The UK climate in contrast is so ideal for them that some think them native! 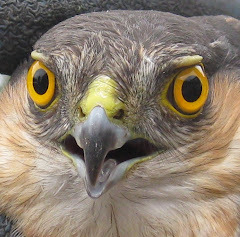 In fact we have only had them since their introduction in 1600 and it was a hundred and fifty years later they were first recorded in the wild. How long does something have to be with us to be considered native? Even now their presence is quite patchy. Although they are to be found in quantity in every part of the UK it seems to me that in most places their establishment has started with a gardener. In wild rural places his cottage might no longer be there. They of course spread naturally for considerable distances. I am not really sure how far and would be delighted to hear from readers the whereabouts of isolated stands. I would in this post like to consider snowdrop’s spread and garden establishment in some detail. Although in the right conditions they are able to seed freely I suspect much of their spread around a garden is mainly by vegetative propagation. I would be be delighted to be told of any galanthic gardens that show me to be wrong. They definitely like us.I know of no soils that are unsuitable in the UK. Some books will tell you that they don’t like very acid soil but that is not my opinion or that of Peter Williams. (Who denies that he is a galanthophile but is going that way). 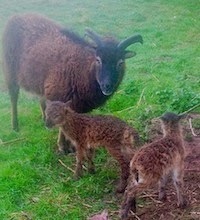 We both also find them to be extremely tolerant of poor drainage (but don’t plant in a bog). 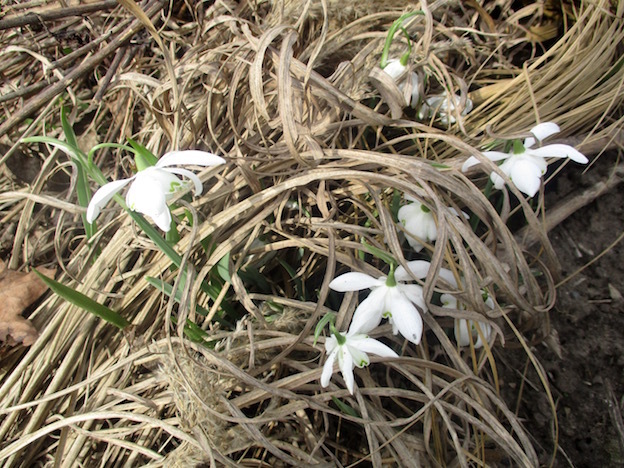 Snowdrops really love cold. Apparently they are able to generate heat at their tips to push through the snow. Grow them almost anywhere in your garden. Everywhere between full light and heavy shade. Mine appear all over. 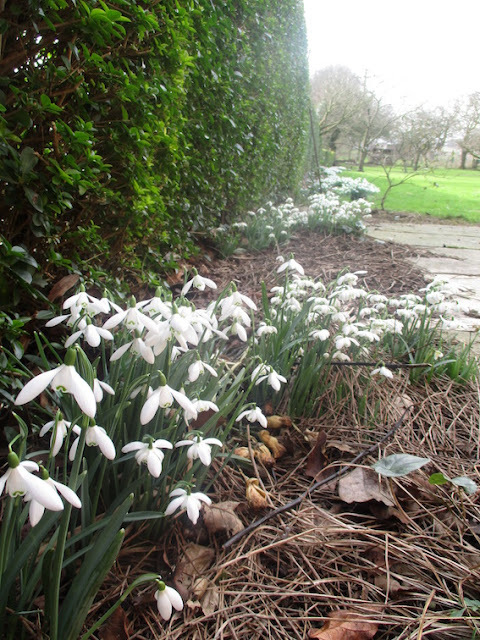 They may be in borders, untidy edges, under hedges and in my lawn. Classically they love deciduous woodland with Winter moisture and sunshine through the leafless canopy. I know most unlikely corners where they thrive even when severely overgrown. When they have completely died down by the end of March without removing them other plants can take their place. It its easier for a none digger like me. Even in a herbaceous border they might clad the ground as long as very early herbaceous cover does not smother them. Other than the lawn I never cut back and merely let the old leaves fade away. Their potential in lawns is often overlooked. Best as clumps in a tightly cut sward where you can for the first Spring mowings skirt round them. Wait until they are severely yellow and brown before mowing them away. Perhaps less successful is to grow them in long grass. If they are thriving in your garden never remove them unless you wish to propagate more. There is no need for transplanting and they go from strength to strength each year. Vegetative establishment from bulbs is easy peasy providing they are not dry from a bulb merchant. Even then if you get your order in early they might be OK. It is widely recognised that they are best planted ‘in the green’. What is not so widely promoted is this might be almost anytime! It may be when you can barely find them before they emerge in January, or when they actually appear, develop, flower or die down! Even when dormant in Summer and Autumn they are successful providing they go back into the ground more or less on the same day. If moving when in growth take a good root ball and disturb as little as possible. 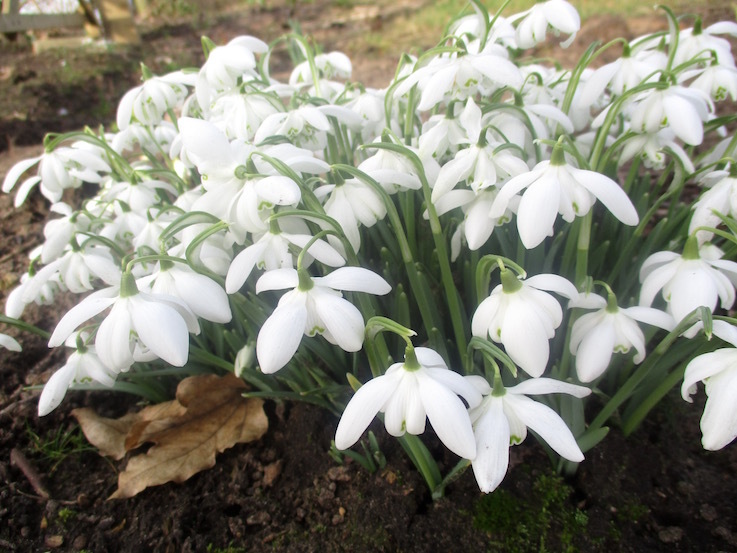 Best in strong clumps of half dozen up to a spade-full. 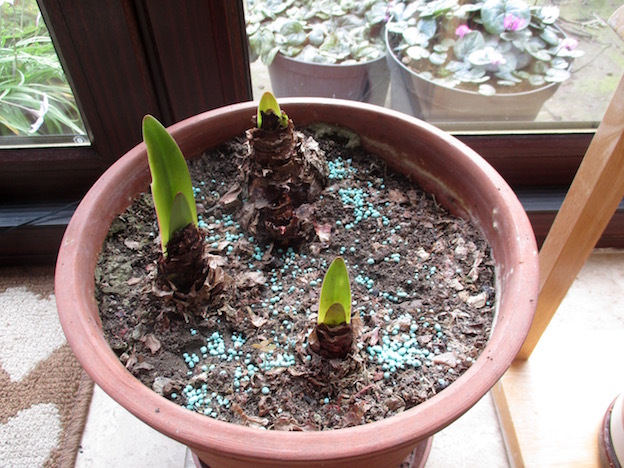 Fiddly separation into individual bulbs will succeed but can involve a slight check! You might rightly protest you need stock to propagate from. It is always unfair on the new gardener! 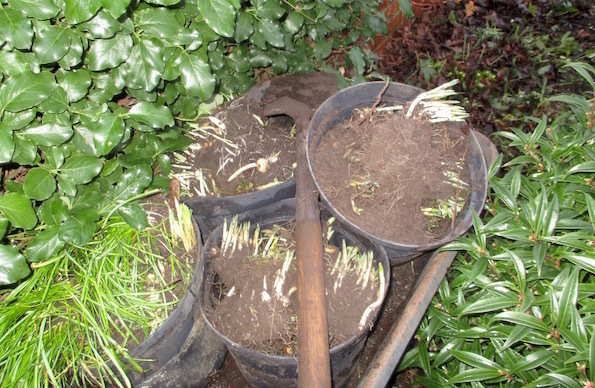 Many gardeners have existing strong clumps (or have good friends who do). If you take say a third of a clump you will never know they have gone and next year the clump will be better than ever. The alternative is to dig into your pocket - for some varieties very deeply and buy pots from a nurseryman. Once started they will double up every year! There are perhaps twenty species and I found 711 cultivars in the The Plant Finder. Some are lost and are no longer available. I suspect their names have been lost rather than the plants not having survived! 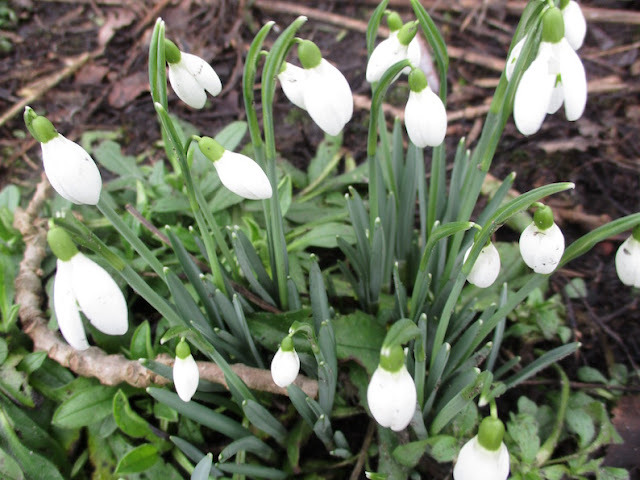 We know a well known botanist who tongue in cheek says there are four kinds of snowdrops - big ones and small ones and early and late ones! Perhaps he should add they might be single and double. (For none aficionados double flowers are those with extra petals or petal-like structures). Tell that one to galanthophiles who worry themselves silly about every fine detail. I think there is a happy medium. Most of my own snowdrops have made rather large and varietally uniform clumps. In my cemetery gardens there are drifts of thousands which are not very diverse. I suspect - but am not certain - that vegetative propagation tends to be more significant than seed with reference to spread. * Crowded together some get pushed to the surface and out of the ground. Animals, flooding and wind do the rest to disperse them. * In the garden the over enthusiastic soil cultivator unintentionally shifts them! Undoubtably self seeding is also significant. Every time a new seedling grows it is genetically distinct and is in effect a new variety - although for none hybrid cultivars not a new species. They appear as flimsy crook-ended thin grassy threads. They might take three years to flower. Many seeds and seedlings won’t make it due to inclement weather such as early Spring drought. Numbers will be diminished when poor pollination conditions mean no seed is set in a particular year. 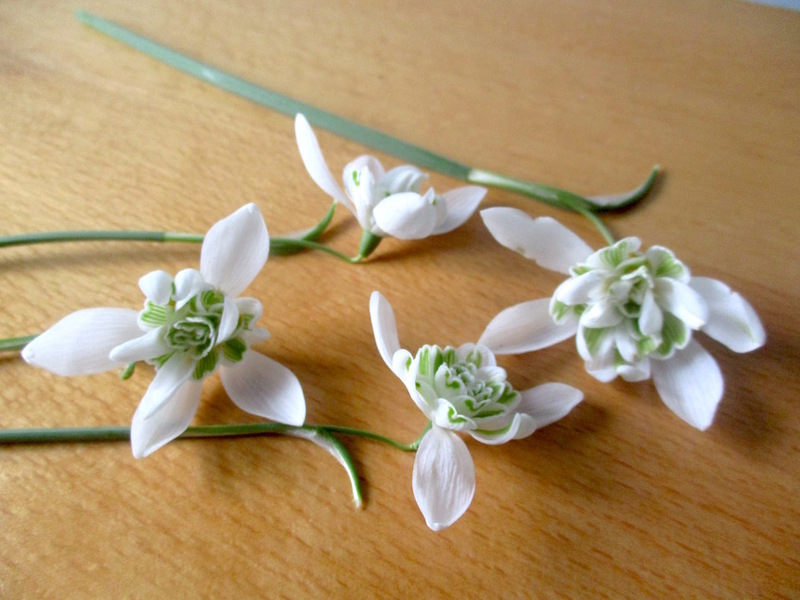 Some snowdrop varieties are sterile and rarely or never set seed. Young seedlings need to compete with competitive plants not least their parents. Its all bit dodgy but its part of the process. Growing from your own seed is actually very interesting albeit not the way to build up a collection! You will often fail to find seed because the ants got there first. You might know form my previous posts I have a soft spot for myrmecochory! Galanthus seed has shiny white elaiosomes which are tiny ant nutrient treats. In nature ants disperse them to all kinds of places. * My friend Peter Williams found several snowdrop bulbs lying stressed on his soil surface. He potted them up and in Spring they produced exquisite tiny-tiny flowers. He took them to his Hardy Plant group sale with full explanation that they would be normal next year. The treasurer slapped a ten pound price on them and they flew off the table. Good for funds. * I have not yet dared tell you about my new project establishing bulbs in Lyndi’s quarter acre field. 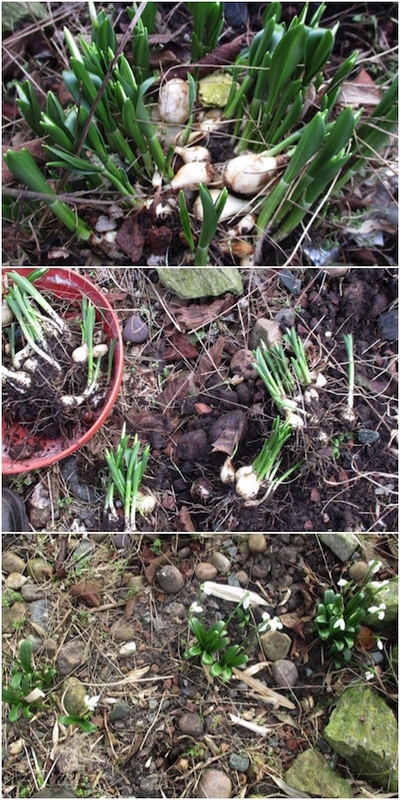 In January I raided my own and Cathi’s garden and dug up well more than a thousand snowdrop bulbs perhaps taking 20% from some of our clumps. That was about 35 full spade fulls subdivided to make clumps of about a twenty. It took all of two hours - a long time for me. Planting of the new small clumps took another 45 minutes. They looked great when they flowered but I have a long way to go to fill a very big field. 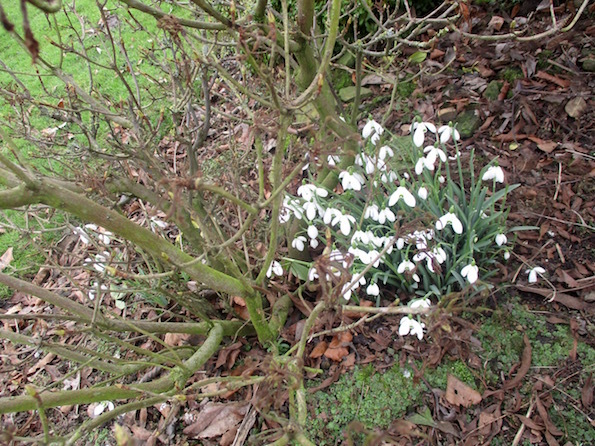 * Years ago I read in the Grower magazine about a nurseryman who propagated his snowdrops by rotavating the ground of his snowdrop patch in Summer. I don’t suppose they were ready for sale the following season nor do I know what proportion of his stock was so treated each year. *Before I left Madeira it occurred to me that I might have told you a porky about there being no snowdrops there. After all the island boasts numerous microclimates and a snowdrop’s cold requirement would be satisfied at altitude. We made several enquiries to knowledgable horticulturists but found none. 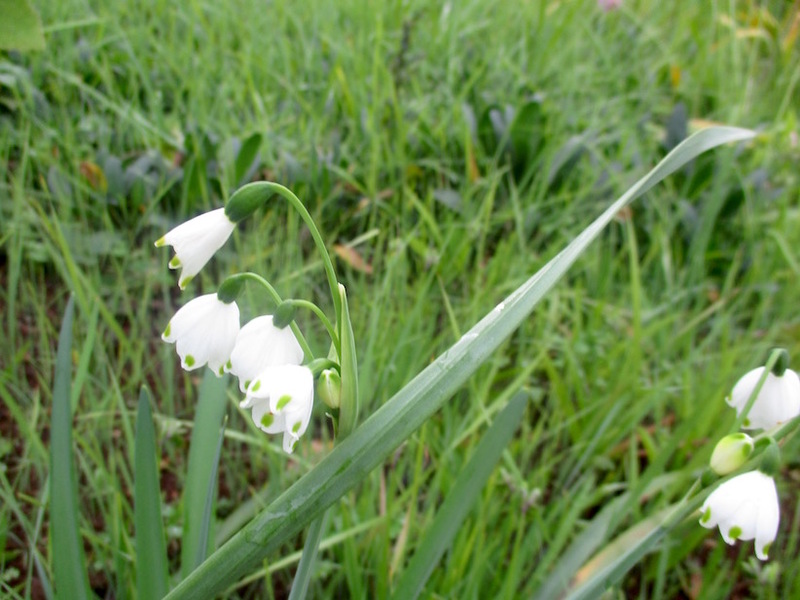 The closest we came were snowflakes (leucojums) at Blandys and we also found daffodils in several places including our hotel garden at sea level. 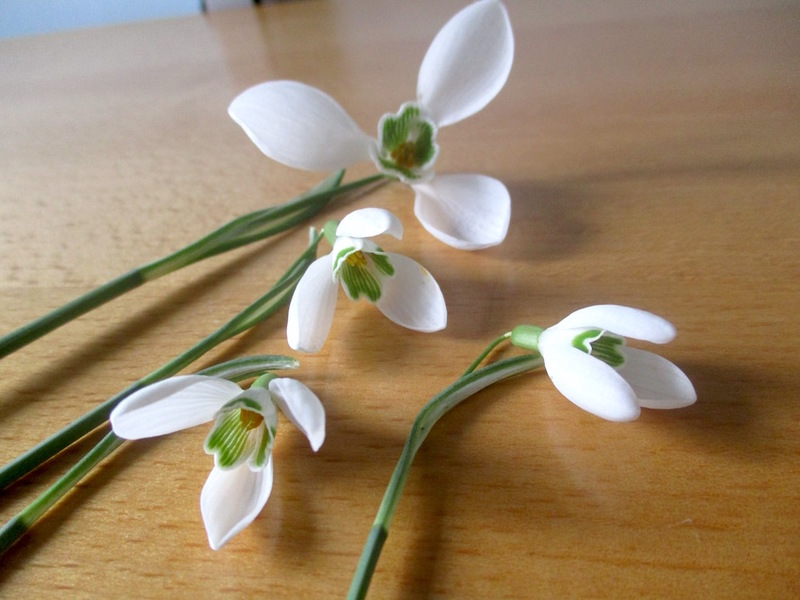 Surely there must be snowdrops on the island. It only needs someone perhaps 500 metres high putting in an order to Parkers! 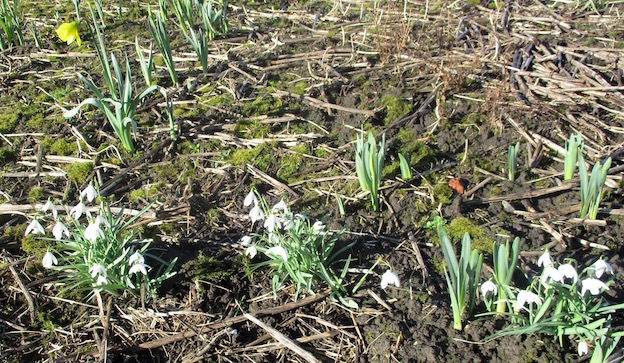 *Still thinking about altitude I read that a famous snowdrop collection in Scotland at 500 feet high flowered two weeks later than a garden at ground level This set me thinking about how high snowdrops grow in the UK. I asked Peter about 300 metre high Buxton and he told me there were plenty there! Princetown on Dartmoor is 435 metres. I wonder? 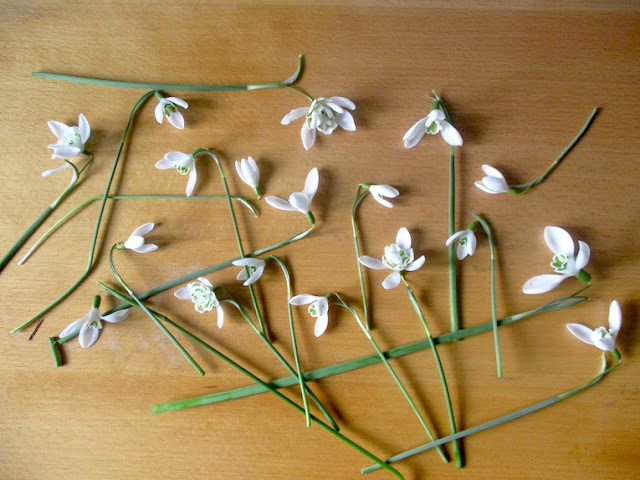 I looked up snowdrop altitudes in its natural habitats in Europe. The highest altitude recorded was 1400 metres. Why that’s higher than Snowden! But then in Southern Europe it can be very warm. My earlier request to my readers is to provide answers to some of my questions today! * It’s back! 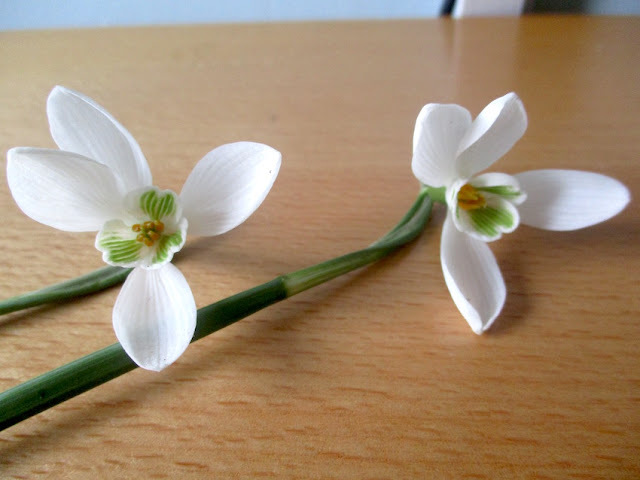 Last year I posted a picture of my four petal snowdrop. Unfortunately it is normal this year. 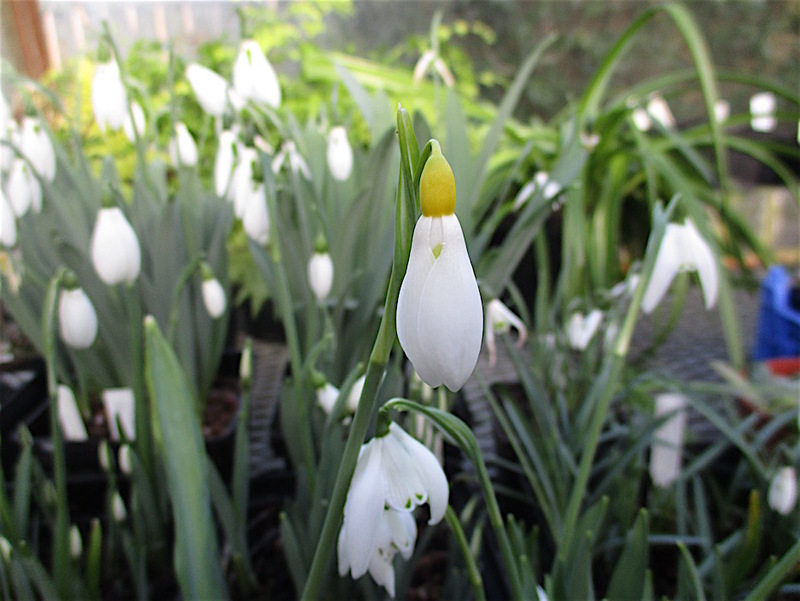 However two other bulbs from the same provenance have performed instead.